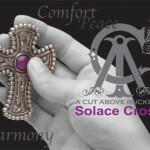 The inspiration behind the Solace Cross came from a gentleman fighting for his life during his battle with cancer. In 2007 he suffered several chemotherapy treatments. To get him through each treatment, he carved a small cross and placed a marble in the center that he would rub as he prayed for strength to endure the pain. These replicas are to inspire others with the same hope, grace, strength and courage of that man. For her ‘cut above’ hard work and dedication towards helping sick children and raising funds for cancer Societies and animal welfare, “saving lives one ride at a time” through her organization ‘Dreaming of Three.’ (Scroll Down to see Jackie’s Story). Jackie will work with our designers to choose a design she likes (or create a new design!) for her hand-crafted personalized buckle she will receive for winning the Make A Difference Challenge. We were overwhelmed with amazing stories of many people who are ‘a cut above’. We were so inspired by many of these stories that we are going to award custom key fobs to 14 additional nominees who are also working very hard to make a positive difference. These hand-cut custom key fobs will be designed by A Cut Above Buckles Founder Andy Andrews and Vice-President Kyle Graff. The 14 additional nominees receiving hand-cut custom key fobs are: Mark & Donna McCain, Brian Whitehead, Joe Powell, Paul Riggs, Michael Minix, Chance Long, The Riders of Innisfail Trail Ride Against Cancer, Penny Mitchell, Tia Borden, Pam Wolfe, Zac Peterson, Mark Drum, Stephanie Castle, and Justice Barker. 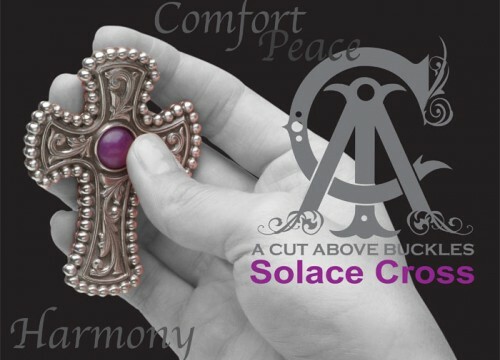 At A Cut Above Buckles, the phrase “A Cut Above” stands for more than just our name. We think it’s a way of life- to do more, go farther, last longer, and be a little bit better every day. Jackie and the additional 14 nominees recognized have gone far above and beyond to help others, overcome obstacles, and work hard to make a positive change in the lives of others, their community, and society. Thank You again to all who participated in the A Cut Above Buckles Make a Difference Challenge. Stay tuned for our next Challenge. Jackie Harris is the founder of Dreaming of Three (DO3), a non-profit organization to help raise funds for Cancer Societies and Animal Rescues by equestrians donating a portion of their winnings to these groups. She started up Do3 only last year after she lost both her father and step-father only 3 months apart from Cancer and Heart Disease. She only started Do3 expecting it would just be her and small group of people, but it quickly spread like wild fire and now Do3 is over 100 members strong dotted all over the U.S. Riders and Rodeo Competitors from all disciplines are welcomed to join and may choose to donate in many different ways. Some donate through winnings, some through hours in the saddle or pledge per ribbon won. Others who cannot ride can donate by matching another members donation. Do3 also holds numerous fund raisers to help animal rescue groups. After hearing about Northstar, a paint horse who was doused in Kerosene and set on fire, Jackie immediately set up an online Auction and over $7,000 was raised to help Northstar. The story was so remarkable that the Northstar Foundation was set up, to help other animals who have been afflicted with trauma from humans. Another amazing party of Do3 is the Rodeo Kids Program. Jackie started this when she first started up Do3. The Rodeo Kids program is set up for State Captains of Do3 to take a child who is battling or won the battle with cancer/disease for a fun filled night at the Rodeo. The child can watch the Do3 member compete, and typically if applicable, the rodeo announcer gives a shout out to the child and the child gets to meet the Rodeo Queen, Bull fighters, and others. They also get to have dinner at a nice local restaurant nearby and are showered with gifts from members and sponsors of Do3. Jackie’s most recent large endeavor has been the Extreme Retired Racehorse Makeover Barrel Race for off the track thoroughbreds. Many Thoroughbreds are very capable of having success in the western discipline, and the challenge is to match 12 capable trainers with 12 off the track Thoroughbreds. After 100 days they compete in a free-style class and barrel class. The race has picked up a ton of momentum and is getting news coverage all over the US. Now that Do3 is really getting on its feet members are able to hold their own Do3 Events to help out even more. For example, a local ‘See No Evil Benefit’ Barrel Series helps raise funds for the Texas Rodeo Kid Dominique McAllister, and what started out as a one day race has expanded into a series due the over-whelming response received from sponsors and locals. 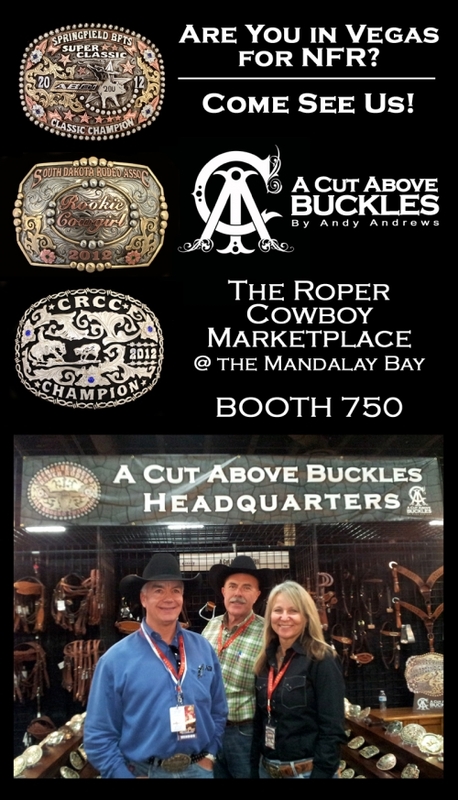 After lots of preparation and hard work, the much anticipated A Cut Above Buckles Headquarters stands open for business at the Cowboy Marketplace during the National Finals Rodeo in Las Vegas. 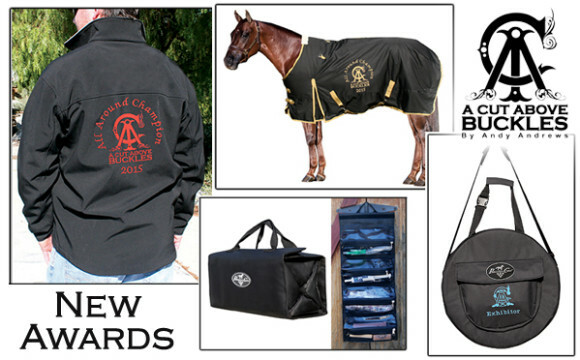 Located at the Mandalay Bay in booth 750, the new line of over 50 award products, custom trophy buckles, leather & tack, and accessories are on display between Thursday, Dec. 6th, and Saturday, Dec. 15th. To conclude this very busy and successful year, A Cut Above Buckles invites the public to come by and see the latest trophy buckles and awards in person. Visitors can pick up a copy of the new trophy buckles and awards catalog, purchase items available from the online store, and speak with a professional sales rep to help design and order custom awards for upcoming events. CEO and Founder Andy Andrews will also be available to meet visitors and discuss new buckle and award designs. With a display twice as big as last year’s, newly designed buckles, new trophy tack, trophy spurs, and more, Cut Above’s growing presence at the Cowboy Marketplace is reflecting the growth of this family-owned business. 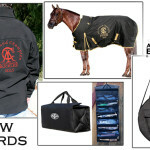 Over the past year Cut Above added 200 new buckle and award designs to a re-vamped website that now includes an online store with buckles, tack, jewelry, and accessories. Highlights of this year include the introduction of the official A Cut Above Buckles Facebook Page now followed by over 600 fans, new regional sales staff joining the growing Cut Above team, and earlier this year the official A Cut Above Buckles Bull, Smooth Sailing, competed with the American Bucking Bull Inc. Back Seat Buckers. 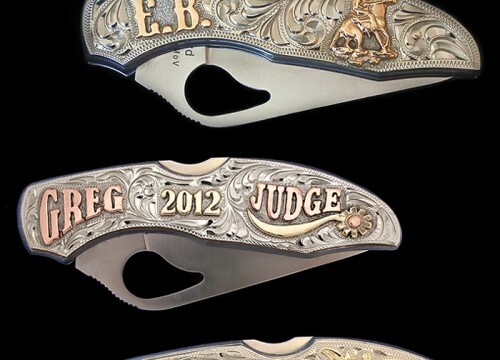 If you’re not sure what to get the special cowboy or cowgirl in your life, our custom personalized hand-engraved pocket knife is the ideal one of a kind gift designed to last. Choose from a large variety of letters, initials, names, logos, stones, motifs, and borders to create a unique gift that you design. We also offer engraved, antiqued, or black backgrounds and an optional customized clip for your custom knife. All knives are hand-engraved.